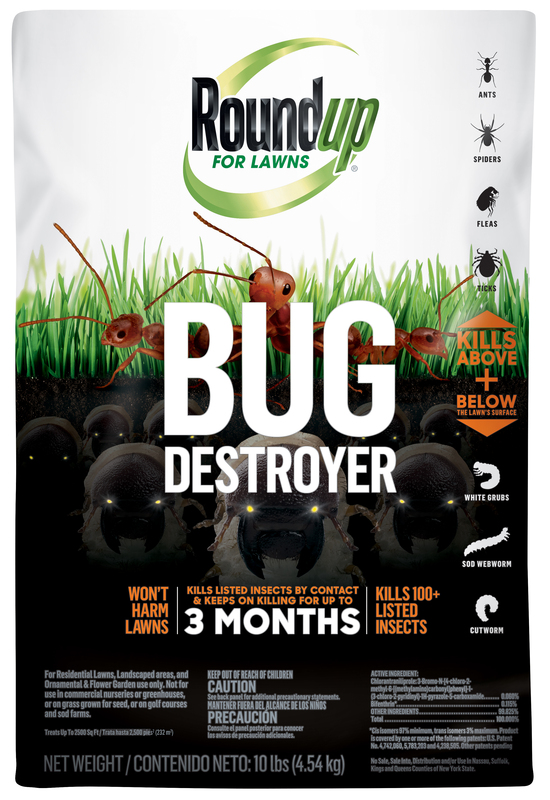 Roundup® For Lawns Bug Destroyer is a dual-action formula that kills bugs above and below the lawn's surface. It kills 100+ listed insects, including ants, grubs, spiders, fleas, ticks, fire ants, sod webworms and cutworms. Plus, it keeps on killing for up to 3 months! Won't Harm Lawns, guaranteed. * Say goodbye to those pesky lawn damaging bugs and get back to enjoying what's good. For best results, thoroughly water treated area immediately after application. -Using a spreader designed for application of granular materials, uniformly apply product. A 10lb bag will treat up to 2500 sq ft.
-For 3-month control, apply 4 lbs of product for every 1,000 sq ft.
-Apply 2lbs evenly over each 500 sq ft area using a hand held spreader. Repeat if there are signs of renewed insect activity. Apply early in the Spring or Summer to prevent infestation. Works best when applied before grubs hatch. DO NOT apply Roundup for Lawns Bug Destroyer when turf areas are waterlogged. The product may not work effectively under these conditions. Do not exceed 1 applications per year. This product is toxic to wildlife and highly toxic to fish and aquatic invertebrates, including oysters and shrimp. To protect the environment, do not allow pesticide to enter or run off into storm drains, drainage ditches, gutters or surface waters. Applying this product in calm weather when rain is not predicted for the next 24 hours will help to ensure that wind or rain does not blow or wash pesticide off the treatment area. Sweeping any product that lands on a driveway, sidewalk, or street, back onto the treated area of the lawn or garden will help to prevent run off to water bodies or drainage systems. This product is toxic to bees exposed to direct treatment or residues on blooming crops or weeds. Do not apply this product or allow it to drift to blooming crops or weeds if bees are visiting the treatment area. If for any reason you the consumer are not satisfied with this product, mail us your original proof of purchase to obtain a full refund of your purchase price. Causes moderate eye irritation. Avoid contact with eyes or clothing. Wash thoroughly with soap and water after handling and before eating, drinking, chewing gum, using tobacco or using the toilet. PESTICIDE STORAGE: Keep out of reach of children and animals. Store in original containers only. Store in a cool, dry place to avoid excess heat. For bags after partial use, reseal opened bag by folding top down and securing. Non-refillable bag. Do not reuse or refill bag. Place in trash or offer for recycling if available. If partly filled: Call your local solid waste agency. Never place unused product down any indoor or outdoor drain. NOTICE: To the extent consistent with applicable law, buyer assumes all risks of use, storage or handling of this product not in accordance with directions. People and pets may re-enter treated areas after product has been watered in and allowed to dry. Kills 100+ insects for up to 3 months. See product label for insects controlled for 3 months.